Victor Bird is a sled enthusiast who is the contributor to this page, which he calls his descent. Sleds and comments are his and much appreciated. Vic can be reached by email. FF Racer In performance, the Racer was the top of the Flexible Flyer line. S L Allen & Co introduced the Racer in 1908 when it introduced the patented grooved runner and "goose neck" bend at the runner’s front tip. The Racer remained a sleek alternative to standard sleds through decades of Flexible Flyer production. My all-wood Racer is a well-weathered example of the initial Racer design of 1908-1914. This old Racer, now devoid of its original graphics, is tempting me to start a full restoration. FF Racer Racer Racers did not sport fancy scrollwork, as did the standard models. Instead, they bore the swift red arrow that was to adorn all Flexible Flyers by the end of the 1930s. The Racer weighed less than two-thirds of an equivalently sized standard model, but it had inches more runner forward of the supports giving it superior steering. My 57-inch D Series Racer is about as fine a mid-1920s original as one is likely to find. New, it cost $6.50. The earlier Racers had two siblings -- the smaller Junior Racer and the slightly longer Tuxedo Racer. The Tuxedo Racer started as a competition-specific sled that Allen designed for the New York State Tuxedo Club. S L Allen & Co offered it for sale to the general public for only a limited number of years. The Tuxedo Racer was the first Flexible Flyer to use the high-performing, metal front end that was later added to the full line of Flexible Flyers in 1915. FF Fire Fly Technically not a Flexible Flyer, the Fire Fly coaster was S. L. Allen’s economically-priced line of sleds. A Racer joined the Fire Fly line in 1917. 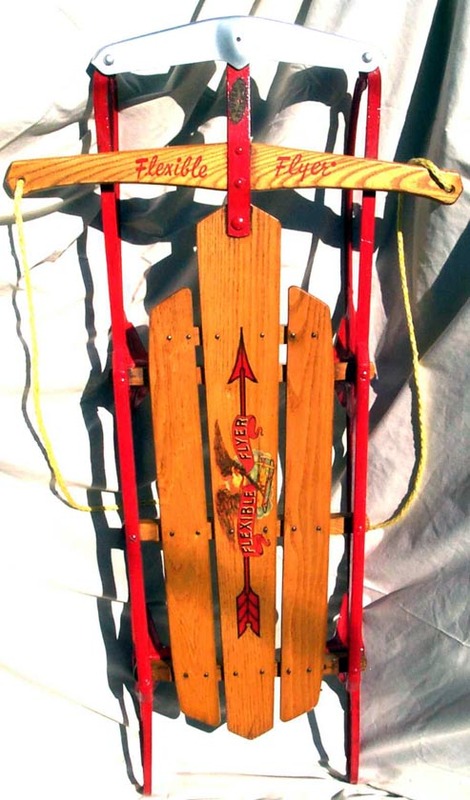 With its all-wood side rails, old-style steering mechanism, and flat runners, the Fire Fly Racer pictured here was no match for even a standard Flexible Flyer let alone a Flexible Flyer Racer, but it did represent a well-constructed and reasonably priced alternative to other sleds of the day. My Fire Fly Racer with its old-style holly branch deck art may date from among the earliest examples. 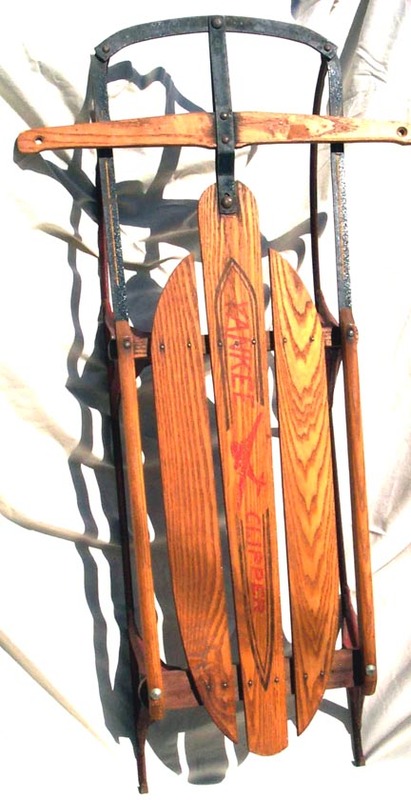 But the absence of design changes in the Fire Fly line (for example, Fire Fly sleds had wooden side rails until 1935) present a real dating challenge, not to mention an anachronistic appearance. FF 41J S. L. Allen produced these beauties until 1968 when the company was sold and moved to Ohio. The 41 referenced the length of the sled. Partially refurbished with newly painted runners, fresh urethane, and a reproduction logo. Abbie, my three-year-old rides this J series from the 1960s. It is six inches smaller than her sister’s sled. It has original graphics, freshly painted runners, and a couple of coats of new urethane. Abbie is still working on her steering skills so we like to point her down an obstacle-free swath of slope. Papa (that’s me) rides a big 60J Flexible Flyer, which is the one I recommend for adults who want to keep most of their body parts up off the snow while demonstrating belly-whompers. S.L. Allen Co. produced these chrome bumper beauties – the H and J series – from 1955 until 1968. That is when Flexible Flyer was sold and moved to Ohio. I like to look for these high quality Flyers at second hand stores and on eBay. FF Airline Patrol 44 Here is an older Airline Patrol. The Airline series with safety runners debuted in 1935. Models sporting the name on the deck continued through 1949. This one is 100% original and has not been refurbished. FF 47J S. L. Allen produced this beauty until 1968 when the company was sold and moved to Ohio. 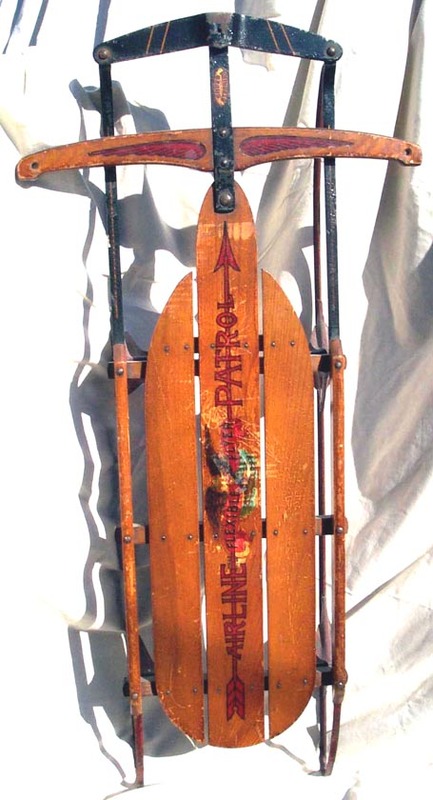 The earlier Airline name for the sled was Airline Pursuit. Here you see the "Meghan Flyer," my six-year-olds 47J from the 1960s. It is partially refurbished with fresh urethane, newly painted runners, Meghan’s name on the steering bar, and a fresh logo. Meghan greatly improved her steering abilities this winter but still prefers to ride seated. We’ll work on the belly-whomper-start next year. FF Yankee Clipper Manufactured by Flexible Flyer as a less expensive sled. Blue Streak Racer The Auto Wheel Coaster Company manufactured this 1950s Blue Streak Racer. Like its better known sibling, the Fleetwing Racer, the Blue Steak is made from selected white ash, same as a Flexible Flyer. These sleds sport grooved runners but lack Flexible Flyer’s patented features like Super Steering. Sears/Flying Arrow The sledding market that S L Allen & Co created with Flexible Flyer also created a host of competitors and imitators. Sears added the Flying Arrow to its catalog around 1927. Priced at $2.69, it cost one-third the Flexible Flyer. My Flying Arrow, possibly a product of the Kalamazoo Sled Co, is a good example of the well-built yet still inferior competitors of the Flexible Flyer. Note that the Flying Arrow still had all-wood side rails in 1927 while Flexible Flyer had adopted a metal front end in 1915. The Flying Arrow also has flat, not grooved, runners. The Sears catalog says, "The steering arrangement is very flexible, easy to work and mechanically perfect." It should be; it is a copy of the Flexible Flyer. But in 1928, Flexible Flyer introduced patented Super Steering and left the competition even further behind.